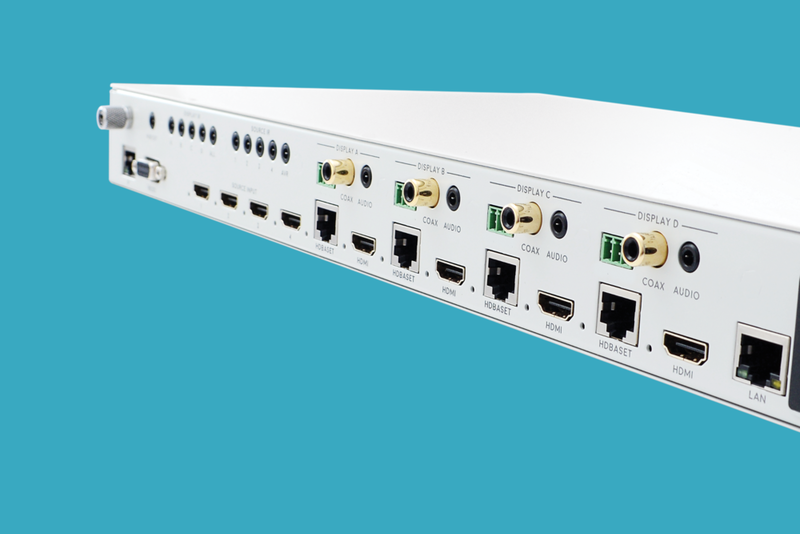 HD Connectivity design and build professional quality HDMI connectivity products, with a core competence in HD video switching and distribution systems. Utilising a mixture of long-distance transmission technologies, such as HDBaseT and HD over IP, our systems are capable of delivering high definition multimedia content and control, to a virtually unlimited number displays over a single Cat5e/6 cable, without any loss in quality. Enjoy up to four 4K and / or 1080p set top boxes in four rooms. Want to watch Netflix 4K or 4K devices like the Amazon Fire TV on your new 4K TV? Use an mHub 4K (4x4) HDBaseT-Pro system to watch them on every 4K TV in your home. mHub 4K (4x4) uses HDBaseT-Pro technology to deliver an incredible 4K home entertainment experience. mHub 4K features HDCP 2.2 support, which allows it to work with every 4K entertainment device and TV around. If you've recently updated all your TVs to 4K or invested in the latest 4K HDMI source devices, such as the nVIDIA shield, Amazon Fire TV and BT Ultra HD Youview box, then you'll need a 4K multiroom HD system with HDCP 2.2 if you want to be able to enjoy the movies and shows these devices offer in 4K throughout your home. The mHub 4K range with HDCP 2.2 will let you send 1080i, 1080p, UHD and 4K 2160p resolutions uncompressed to each of your TVs, giving you a truly amazing 4K home viewing experience. Because it uses HDBaseT-Pro technology, the mHub 4K (4x4) also can deliver high-speed internet (10/100 Ethernet) to each of your TVs, for things like online gaming and smart TV services. The display receivers that are positioned behind each of your TVs are PoE (they do not require power supplies), meaning that they can be easily hidden away and do not take up precious socket space at your TVs! If you're a home cinema enthusiast or audiophile, mHub 4K (4x4) can support all surround sound multichannel audio formats from 5.1 right up to the highest-spec object-based audio formats, called Dolby Atmos and DTS:X. Like all of the mHub family, mHub 4K (4x4) requires a single Cat 5e / 6 cable to be run between the central hub of the mHub 4K (4x4) and the display receivers, which sit neatly behind each of your four HDTVs. We recommend using Cat 6 cabling as standard. This Cat 6 cable can be a maximum distance of 70m in length if you're planning on sending 4K video to each TV. or can be a maximum distance of 100m if you're looking to send 1080p video to each room.